Our first hotel in Dubrovnik was the most special hotel of our whole stay; in fact, perhaps one of the most special boutique hotels I’ve ever stayed in. 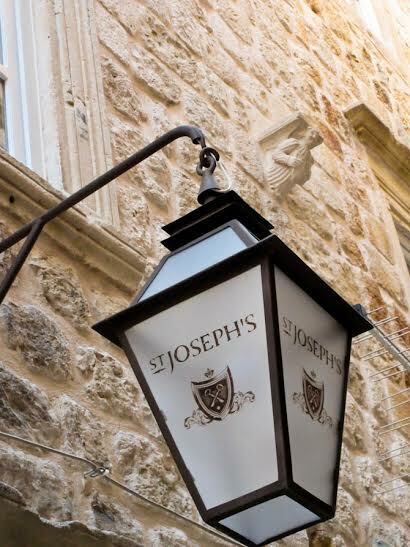 We checked into St Joseph’s Boutique Hotel, after a fairly hectic trip to Dubrovnik from Hvar and were immediately struck by just how incredible this hotel is. The hotel is built in the old part of Dubrovnik and is in a UNESCO heritage house; as such there are traditional features everywhere and all the old beams and windows have been preserved. It was a real change from the modern features of Hotel Amfora! There are only 6 rooms in the hotel: a deluxe Queen suite, a deluxe apartment and a deluxe King suite, that we stayed in. The first thing we noticed was actually the scent of the room; a welcoming, comforting scent that I thought I recognised, so I had to ask the manager, who was showing us the room, what it was. I discovered that the whole hotel is scented with The White Company scents which he orders from the UK as he thinks that they’re the best scents available – and I happen to agree, I adore them! Our room had a gorgeous King size bed, which was incredibly comfortable. Zeljko, the general manager, says he sourced them specially as he wanted to ensure that the beds, along with everything else in his hotel, was of the highest quality. In what I think is the highest praise, he’s actually had a lot of guests asking where he found the mattresses as they want to have these beds at home! The linens too were exceptional: pure Egyptian cotton with that silky, pure feeling that makes you feel so relaxed, cosy and luxurious when you jump into bed. Even the backs of the chairs had the most intricate details; nothing has been forgotten in this hotel. I particularly loved the tones and the colours as they made the room so warm and welcoming. There was actually a surprising amount of furniture in the room, but it’s all so tastefully and luxuriously decorated and arranged that it doesn’t feel crowded; rather you feel that there’s simply so much space for you to relax and enjoy your surroundings. And a heavenly rain shower. It really was one of the most beautiful hotel bathrooms, and a wonderful place to get ready before exploring Dubrovnik or heading out for a romantic meal. In case you were worried about the sight of a kitchenette ruining the beauty of this room, panic not, it’s carefully hidden behind the mirrored sliding doors you can see here! Not only was this room exquisite, but it’s also pretty picture perfect, so I let my inner shutterbug loose and took quite a few photos! The final touch of the room that I adored: the shutters that blocked out the morning light completely and the curtains that gave the morning light the most wonderful glow when you let the light in after a lazy morning in that very comfortable bed. The whole hotel is decorated in a similar fashion, meaning that the lush and luxurious feeling isn’t confined to your room, but flows throughout. Now, there’s one more exceptionally special thing about this hotel that really set it apart for me. In fact, I think this is going to be pretty hard for any hotel to beat in my books. As the hotel is so small there is no restaurant, but instead they serve breakfast afternoon tea style in your room, for you to enjoy at whatever time you ask for it. It absolutely took my breath away; it was so special. And it’s an experience I don’t think I’ll ever forget. The green juice is made from a special recipe that Zeljko’s sister found in New York when she was living there, and each morning one of the girls goes to the market to buy the ingredients and makes the juices fresh just before bringing them up to guests rooms’. It’s delicious, healthy – and the recipe is kept under lock and key! It’s the perfect complement to the pastry treats! The coffee, which I had actually been quite disappointed by in our previous hotels, was astoundingly good, and to a caffeine addict this was a very welcome treat. So good in fact, that I retreated back to bed to enjoy a second cup after breakfast! Unfortunately, we only stayed one night in this little haven, so after breakfast, we opened the curtains…. …packed up and said our goodbyes to this little haven in the middle of Dubrovnik. If you’re looking for a beautiful boutique, luxury hotel in Dubrovnik, this is honestly one of the best hotel experiences I’ve ever had. I wouldn’t hesitate to stay here again in a heartbeat. Little hint: as it’s a UNESCO building, there are restrictions on the frontage that hotels and shops can use, so look out for this magical little lantern to tell you you’ve reached this paradise..! Our stay was complimentary but all opinions and photos are my own.